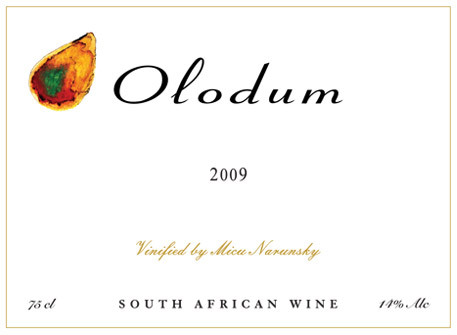 Olodum is the alternative red blend in the portfolio of Micu Narunsky Wines. Based on the Tinta Barroca grape variety with Touriga Nacional in the supporting role, Olodum is a fruit driven wine with a Mediterranean feel. Olodum is essentially made from the same components that make up Iemanjá. The same meticulous winemaking practices are applied to create a wine that is a true expression of South African terroir. 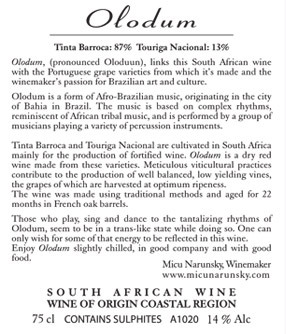 Prior to naming the wine Olodum it was known simply as Tinta Barroca/Touriga Nacional. The 2007 vintage can be found on the winelists of Greens restaurant at the Cellars-Hohenort hotel in Constantia and the Four Seasons restaurant at Diemersfontein in Wellington. The 2008 vintage will be the first baring the new name, and will be released in September 2010. The name Olodum (prenounced Oloduun) represents a form of Afro-Brazilian music. Originating from the city of Bahia in Brazil, Olodum combines percussion music with song and dance. The rhythms of Olodum are deeply routed in African tribal music. Vintages: 2006, 2007; sold out, 2008; to be released in September 2010.